Dan Sullivan, Former Tommy DeVito of Jersey Boys Toronto Launches ‘Places, Please!’– A Hilarious and Heart-Warming Memoir! TORONTO/NEW YORK, June 29th 2012, Canadian e-publishing house Iguana Books releases Daniel Robert Sullivanâ€™s backstage memoir Places, Please! (Becoming A Jersey Boy) as part of their inaugural list and just in time for the hot summer theatre season in Canada and the U.S.
Everyone has heard of the Jersey Boys. Thirteen million people have seen the show, totaling more than $1 billion in worldwide ticket sales. Places, Please! documents Daniel Robert Sullivanâ€™s transformation from a â€œsmall-timeâ€ professional actor to a musical superstar, his two years of auditions, weeks of rehearsals, and hundreds of performances in the Toronto Company of Jersey Boys, where he appeared as bad-boy Tommy DeVito. Since its debut in 2005, Jersey Boys has won four Tony Awards, including Best Musical, making it a staple of musical theater. 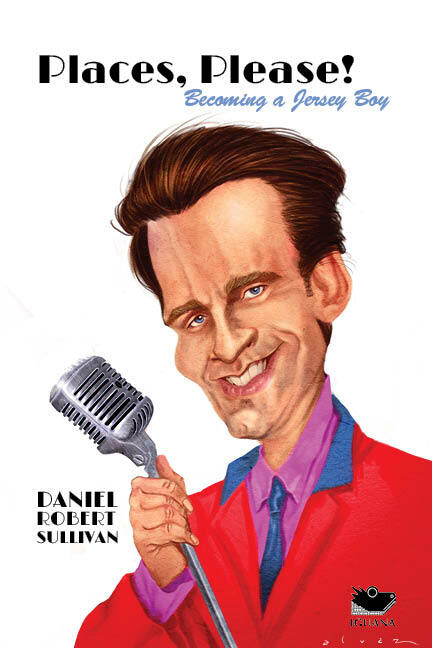 The New York Times referred to Daniel as having â€œthe seductive magnetism of a snake-oil salesmanâ€ and his wife agrees. The two live in Manhattan with their lively children. Having toured all over the world, Danielâ€™s account of the backstage secrets of the musical will appeal to readers all over the globe. Places, Please! is a memoir that can be enjoyed by anyone inside or out of the industry who enjoys a great story from an author with a perpetually optimistic smile. Neither a plea from a struggling artist, nor a dry account of the theater, this novelâ€™s humor and wit carries the audience with it at a fast pace. Jersey Boys tells the true-life story of Frankie Valli and the Four Seasons and features such hits as â€œSherry,â€ â€œBig Girls Donâ€™t Cry,â€ â€œWalk Like A Man,â€ and â€œCanâ€™t Take My Eyes Off of You.â€ The production is currently in its seventh year on Broadway, and is also playing in Las Vegas, London, Auckland, and is on two US National Tours. Places, Please! will be released from Iguana Books on July 25th 2012 at a special book signing event at the Toronto Centre for the Arts following performance of Dancap’s Million Dollar Quartet. Places, Please! can be ordered from IguanaBooks.com on July 25th 2012. Congratulations to Dan on this wonderful memoir!! I am so anxious to read about Dan’s journey from “small time professional actor” to “musical superstar.” While compiling and documenting his great ride, by speaking with many of us fans, he’s kept the spotlight on the entire “Jersey Boys” experience, and not only himself. I not only witnessed Dan’s talent as Tommy DeVito in “Jersey Boys”, but have subsequently seen him knock it out of the park as McMurphy in “One Flew over the Cuckoo’s Nest” at the Ivoryton Theatre in Connecticut and in several productions at the Playwright’s Theatre in Madison, NJ. In speaking with him personally, in addition to his great talent, I’ve experienced his creativity and his wonderful sense of humor. He also realizes that work is only one part of life, and indeed cherishes his time with his lovely wife and two children. I can’t wait to re-experience through “Places, Please!” the memoir destined to make us all believe– “small time professional actors”, creative team contributors, Blog writers, the original 4 Seasons, and thousands of fans– that on a Fall night in late 2005–miracles do indeed come true. Congratulations, Dan. Can’t wait to get my hands on that book! A behind-the-scenes account by such a talented cast member. It’s hard to imagine that Dan won’t be back on a JB stage someday – his performance in Toronto – and as the lead in One Flew Over the Cuckoo’s Nest – were both mesmerizing. Something you just don’t forget. A real stand-out talent and now ‘author,’ also! Jersey Boys fans, almost by definition, love a good backstory. And a backstory ABOUT a backstory – well, it’s is like hitting the trifecta.